New with cell repair. Repairs inside the hair cell rp to 130% more shine. Cell repair, liquified silk and gloss enhancer system. Smooth & shine. Do you have brittle, dull hair? 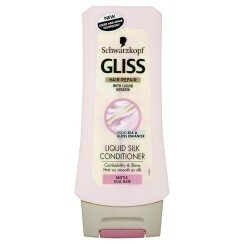 The Gliss formula with elements of liquid silk and a gloss enhancer gives suppleness and breathtaking shine. Perfect combability & protection against hair breakage. Silky suppleness & shine. Innovation: Because the Gliss Cell Repair System contains proteins that are identical to the hair itself, it is able to repair the hair deep inside. The product itself is silky and glossy, but the hair do not get these effects from this conditioner. it is cheap and can be found in pound stores. Maybe on other hair types it works better, on mine there is no effect. Even though it helped to detangle the hair, I don't love it as it weighs my hair down. Of course, it's cheap... Maybe it would suit those with chemically processed hair, who need very intensive treatments. This conditioner is great for someone on a low-budget as it is very cheap at just £1.99 per bottle. However by spending just that bit more you can probably get a much better conditioner which will actually condition your hair.